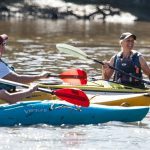 Give paddle sports a try with Thames21, the Sharks Canoe Club and the Friends of the Fray’s River Group! Canoes and Kayaks will be available for all ages with qualified instructors. The sessions start at 4pm and run through till 8pm, book your 30 minutes session on a first come first served basis.